The Natural Environment within the Whaingaroa area is diverse and comprises many types of natural habitat. The Land – The area includes a range of land types with underlying rocks including limestone, volcanic and mudstones. The land varies from very steep and unstable to gentle fertile river valleys. The land has been largely cleared of forest, scrub and wetlands in the last 150 years and then developed for farming. The indigenous forest that remains today is mainly above 400m. Because of inherently unstable geology and lack of forest cover, many of the steep slopes of the catchment are prone to slips, gullying and sheet erosion. As a consequence, streams and rivers can carry high silt loads especially following the intense rainfall events experienced on the West Coast. The forest covered Mt Karioi is the largest formally protected area in the catchment. Extensive predator control is currently being carried out on the maunga and surrounding land my the Karioi Maunga ke te Moana project. The Harbour – The Whaingaroa harbour catchment covers 525 km2 and the harbour covers 35 km2 and has 220 km of coastline. It runs 12 km inland from the entrance, for the most part is less than 2 km wide. Many small streams draining the steep catchment join to form larger rivers such as the Waingaro, Kerikeri, Waitetuna, Wainui and others. These feed into the many arms of the Whaingaroa harbour. Raiparian fencing and planting by landowners and Whaingaroa Harbour care over the past 20 years has improved the water quality within the harbour. The People – The people of Whaingaroa live close to the land and sea, and many derive their livelihoods directly or indirectly from the surrounding natural resources. 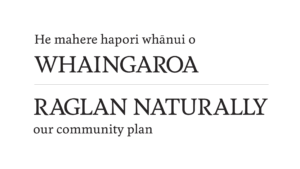 There are several high-profile environmental groups and organisations based in the area (detailed below), all working towards protecting Whaingaroa’s natural environment. Increasing amounts of waste in the ocean being washed up on our shores – threat to wildlife and reducing enjoyment value of our wild spaces. How does this challenge impact on the Natural Environment? How does the Natural Environment impact this challenge? What is the opportunity for the Natural Environment in relation to this challenge? Impact: Greater stress on natural environments, leading to degradation. Greater stress on infrastructure, leading to increased pollution. Opportunity: Eco-tourism. Engage and inspire visitors with Raglan’s success stories. Increased funding for environmental initiatives through ‘tourist tax’ (e.g Able Tasman area). Opportunity: recognition of the unique status of Mana Whenua, respecting and honouring their knowledge and experience, and their cultural and spiritual values, in relation to the natural environment. Impact: Uncontrolled, poorly thought out town planning and urban/rural development places further strain on biodiversity. Opportunity: Increasing population within area means more people to engage in local environmental initiatives – more volunteer manpower. ● Harbour wide development consents and riparian planting spaces taking into account changing sea levels. ● Community is aware of what is going on, and empowered to have their voices heard. All plants, animals, fish and shellfish will be managed in such a way that the resource is protected for future generations to enjoy their use at the same levels as today (2018) and if possible restore the stocks to a better level than 2018. Attention to pest plant species before they further overwhelm existing reserves spaces and private property. Mixed ability access ways though all the reserve spaces, ie, wheelchair, pushchair, flat options.